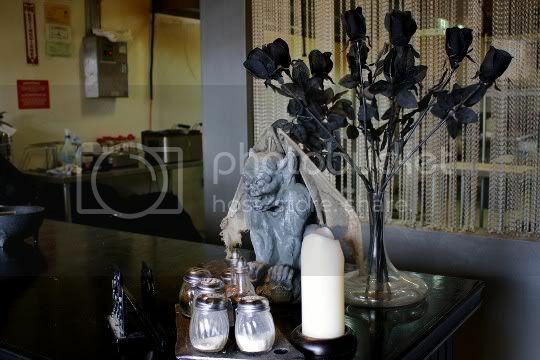 A punkrock-goth-emo dream, Lucifer's Pizza (yes Lucifer, as in that one) is a tiny but statement-making Los Feliz restaurant, offering up creative and tasty pizzas and appealing to all kinds of diets. So you know what that means...vegan pizza! The small, dark interior is almost something out of a haunted house or death metal video. 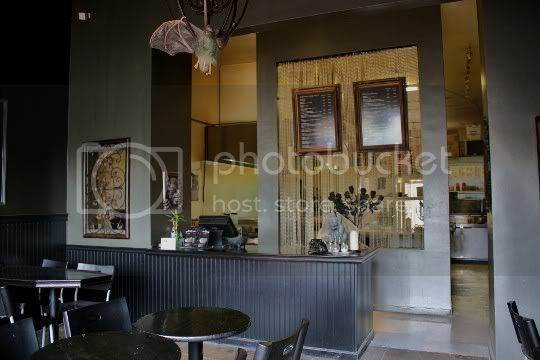 Matte black walls and an ancient-looking wallpaper give off a spooky vibe, while a mesh chainlink sort of thing divides the front counter from the rear kitchen and displays the menus. 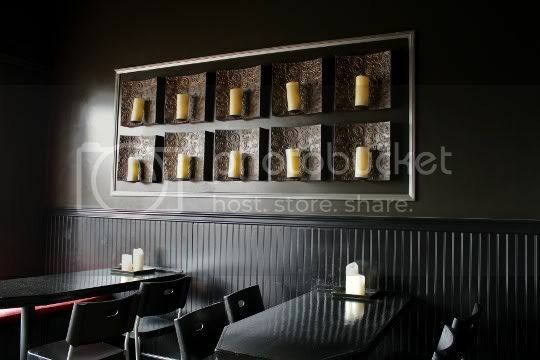 The seating is limited: only a few round tables, a red quilted window bench, and of course the black coffin-shaped tables against the wall. 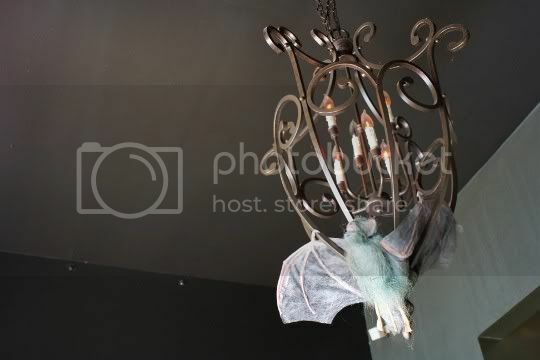 Decor includes a dungeon wall of candles, a chandelier and its vampire bat inhabitant, nightmare-inducing gargolye heads on the walls, and a soothing vase of black roses near the peppers and spices. 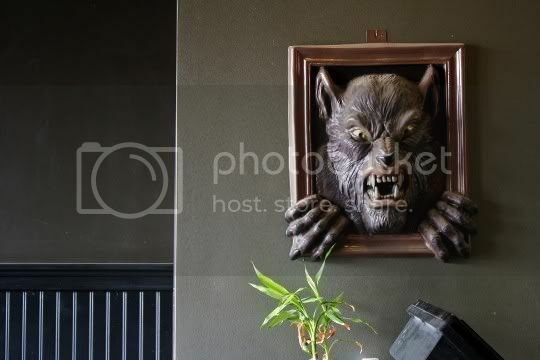 You may want to call in your order or opt for delivery if you're easily frightened. But in all seriousness, this place is awesome! Lucifer's not only offers vegan pizza, but gluten-free crusts as well. Of course, you have to pay extra for these things, but I'd say it's pretty well worth it. The vegan cheese of choice for this place is Daiya, and it'll cost you $1 extra for a personal (which is actually a pretty good size) or $2 for a large. Also a heads up, the menu prices seem to be a bit off: I was charged 50 cents more for one pizza, but then 50 cents less for another. It balanced out in the end, but just something to be aware of. The menu doesn't really seem to be tailored toward creating your own pizza combination (at least from what I could see). For example, there's no list of ingredient choices; instead, you have to choose one of the premade items. This isn't a bad thing, as the menu items are super creative and all across the board. If you want to make the pizzas vegan, however, you'll have to omit some of the ingredients. I somehow missed the "chili rating" when ordering, but this place is known for their spicy pizza sauce. Simple yet delicious. 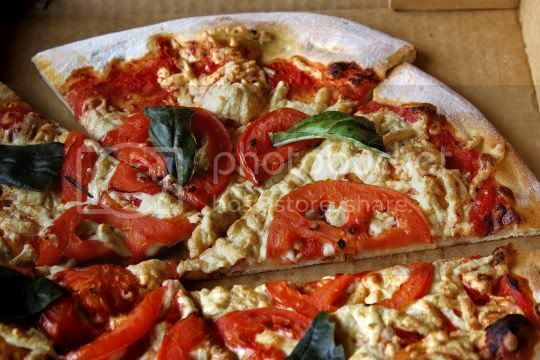 This thinly crusted, almost flatbread-like pizza is covered with Daiya mozzarella, sliced tomatoes, and fresh basil leaves. The basil is atop the pizza pre-baking, so it ends up slightly crisp and toasted. It's an interesting method, and adds a nice delicate crunch. The cheese is salty and slightly creamy under the juicy tomatoes, so you get the feeling you're eating a grilled cheese. So yummy, and so easy to eat all in one sitting! I normally don't get the standard "veggie" option when I eat pizza (as most would assume), all because of those damn pesky and gross sliced black olives. Ack. They can ruin an entire pizza! 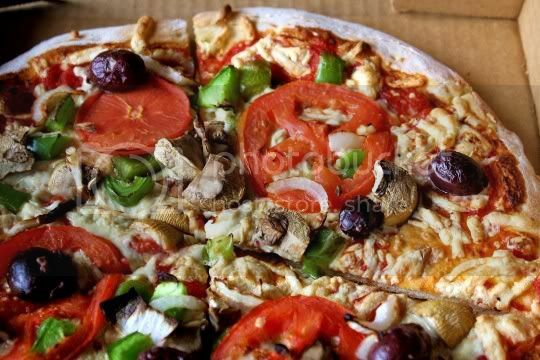 I have many memories of being at social functions where pizza is served, and it's always assumed the "veggie" (with everything on it) is acceptable, and then I sit there and proceed to meticulously pick off every single black olive... Anyway, I digress. Big ups to Lucifer's for using whole kalamata olives! Yes, I actually think these are tolerable, and only a few on the entire pizza adds just the right amount of salt and brininess. There's also Daiya mozzarella, sweet bell peppers, muchrooms, onions, and big juicy tomato slices. A veggie pizza I can definitely approve. 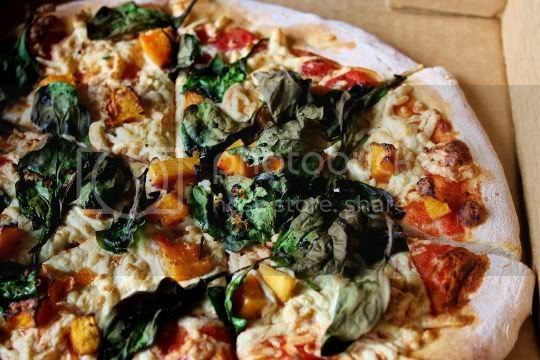 One of the more creative options at Lucifer's, this pizza consists of Daiya mozzarella, pumpkin cubes, roasted chopped garlic, fresh basil, and spinach. What an amazing combination! The pumpkin is surprisingly sweet, almost like it's tossed in brown sugar or maple syrup before baking, and is a great flavor combination to the salty cheese and tangy sauce. Basil and spinach are slightly crisp, and the roasted garlic adds a nice smoky pungence. Of course, I wish there had been a lot more of the garlic, so I'll know to ask for more next time (and there will be a next time with this one). 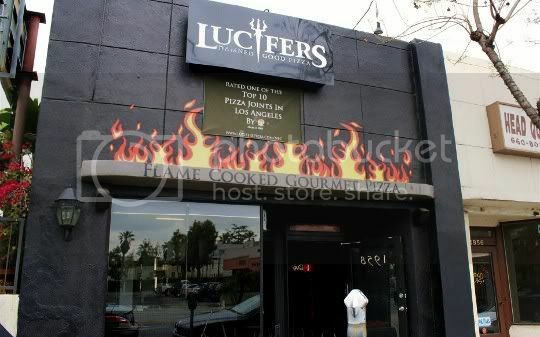 I definitely want to visit Lucifer's again. While I can't wait to another dose of demon gloom and doom, I also want to try veganizing some of the other pizza items. You know, like Thai Satay Chicken pizza without the chicken, and Ringburner (use your imagination) without the pepperoni. See y'all in hell! Ok, I've GOT to go here! It looks like they took a lot of inspiration from Hell Pizza in London, which is awesome. I'm not a vegan but I definitely indulge in green gastronomic treats. The Margherita is mouth-watering. I couldn't wait to try it when I visit LA! I am a half-vegan, and I will indulge in this heaven-sent treat. I know that doesn't make sense, but I do like to eat healthy.